Offering subscription-based information products are often more rewarding than selling one-time information products. In this episode, get solid pointers from an expert who enjoys great profit from his info products business and has coached others to similar success. 09:29 – Start with low price first? 15:30 – Why be wary of partnerships? James Schramko here, and today’s topic is actually brought to you from Colorado. I’m recording this podcast at an event that I’m attending. But I want to talk about some tips for building and packaging an information product. Plus, you’ll find out how I transitioned from selling one-time information products into membership subscription business models, because this is something that I get asked about a fair bit. First a little bit of background. My first online course was actually 10 lines in an Excel spreadsheet. It was actually a checklist that I was using on how to build a website using a particular program, which was called XSitePro. Now that software is pretty much dead these days. This is many, many years ago. And I thought the software program was really good, because it was the first way I was able to build and publish a website by myself. And these days, of course, I don’t think people should even try and build and publish their own website, when there’s so many available WordPress developers and other platforms that allow you to build websites quickly, and to be able to hire people to do it. But at the time, it was important that I learned to do this myself for some reason. And I knew that I could make the software better, with a few modifications. And as I was learning a lot about search engine optimization, I knew there was some things that I could do each time I built the website to improve its chance of ranking. And then I was actually building a case study site to promote the software as an affiliate. And this is where I got my first $100,000 in sales, as an affiliate. I’ve since then continued to make over $100,000 a year as an affiliate, and that’s been for the last 9 or 10 years. Now, I originally called this a cheat sheet, and I offered it as an incentive for people to buy the software from me instead of from my competitors, so that I would get the affiliate commission. And of course, I would disclose the fact that I would get an affiliate commission. I turned that spreadsheet into a Word document, which was effectively my first information product. And then I printed it up with some nice pictures and screenshots, and eventually it grew from a few pages to many pages to 130 pages, and I even created my first membership around this. But it was a one-time access, and that’s probably one of the other mistakes that I made. Now my natural instinct at the time, as a general manager with a Mercedes-Benz dealership, was to keep checklists and have standard operating procedures and systems. So I used to have all these systems as a salesperson and a sales manager and a general manager. So I’m a big fan of frameworks, because look, even pilots and doctors have checklists. At the time I was listening to some material, one of the guys was talking about complementing a niche rather than competing in a niche, and I thought that was a great concept. So that’s how this cheat sheet gave me an advantage over my competitors. Now I realized I could really add value rather than offer a discount. I don’t like it when I see competitions of prices and people offering cash rebates, because that gets you a bad customer, generally, a price-oriented customer, but it also diminishes your margin. So I’d find a way to keep the full margin, and actually have a delighted customer who’s getting more value than just buying the product directly as an affiliate. It was the opposite of a discount, which is something that worked out to be really good for me, because I’ve ended up with some of those customers continuing to be customers now, a decade later. Now people who go into the marketplace offering rebates and cashbacks are racing to the bottom. It’s not a good strategy. So if you’re listening to this and currently your best strategy is to offer discounts or rebates, have a rethink about that. I went on to create a value add that added more value to the buyer’s experience, that allowed me to get the full commission, and it worked out so well. The cheat sheet was very popular. In fact, people who already had the software found out about this thing, and then they started asking me directly if they could get it, and they were willing to pay for it. One day came home from work and I found my inbox was flooded with people trying to send me $40 to buy the cheat sheet, because they found out that someone else had purchased one. And this is when I realized I had a product. 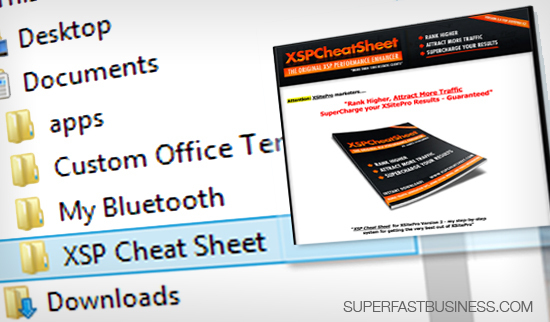 I ended up being able to sell more cheat sheets to people who already had the software than I was selling as an affiliate to people who wanted the software. And that was when the scale tipped across to my first real information product on its own domain with its own sales letter. In fact, I moved house that week when I launched it on the Warrior Forum as a Warrior special offer. And I made $1,000 per day in sales, and that was when I thought that if I could just put out information products instead of working in this job, then I could probably do this full-time. Now as with many things, my best topics started around a self need. So this is the idea of passion versus commercial. If you can start with your self need, then often you’ll find a solution that other people will also need, and you’ll have all the information available to you to help you construct a good product. Because I was trying to figure out how to rank websites, or to build a website with software, it’s logical to think that other people would also be trying to build a website and rank their website. In fact, to this day I still have a search engine optimization business, because people still want to rank well in the Google search results. By solving my own problems through research and trial and error, I was actually investing in creating information that became a resource that was valuable to other people. As with most things, I usually solve my own challenges first, I document it, and then I find other people who have the same challenge and then I get them on board. And they’re pretty quick to tell you what they need and what else they would like help with. And if you were to look at my business today, 10 years later after I started, it’s actually a very simple business. I’m just helping people out with things that used to be a challenge for me, but are no longer a challenge for me because I solved it, and then made the solution available to other people. I think you’ve got to be at least interested enough in your topic to surround yourself with it for a number of years, and if you are, then you’ll be able to build businesses around these ideas that have a natural leaning toward your interest, but also they’re commercially viable. Let’s talk about course outline templates for a minute. Since I did the cheat sheet, I learned about format, which is something I discovered when I went to a presenters’ course. And the short version is that it really helps people cover different modalities and learning styles, and the format is Why, What, How, and What If. And I’ve done previous blog posts and podcasts about the training format, and I will link to it in the show notes from this episode. I then added action steps and printed out a template that you can download that makes it really easy to come up with your own information product in less than an hour. Here are some tools that I use to do this: I use the training sheet, I use a pen, and sometimes I’ll use a whiteboard to brainstorm ideas. I might get some ideas or ask my team to research stuff using Slack. I’ll also use Keynote at times to present slides which I’ll record on ScreenFlow and then store in Dropbox. These days, and I’ll talk more about this in a moment, I put my information products inside my forum. I use Ontraport to gather up all the emails, and I use LeadPages to get opt-ins for free giveaways, and I use Nanacast to process the payments, it’s a great shopping cart. When you’re thinking about how people consume, remember that people do learn differently. In fact, for that reason, I’ll usually always transcribe my audios, and often there’ll be a video as well. So if people can watch a video, listen to an audio or read a transcription, and of course with illustrations makes it even easier, then you can literally just talk into a microphone and that will be a great starting point to get your information products down. You don’t have to do hair and makeup and lighting and cameras when you’re doing just audio, so it’s so much easier. In fact, I can record this podcast while I’m travelling, without having to worry about any more equipment than a simple Lavalier microphone plugged into an iPhone. The thing that is important to me is working in a medium that’s easy for me to create content. So I can create content easily if it requires less complexity. The other thing about audio is you can actually hear tonality, and you can build trust, and it’s a very personal medium. Now I had a few stumbling blocks along the way, but not too many, because I’ve done my research, and I always think it’s easier to learn from other people than to make the mistakes firsthand. I think one mistake that I’ve made, and that other people make, is the way they package products. It’s very tempting to start off with an information product as a one-time product, and that’s how I started, and a small-priced product as well. And I quickly moved into the membership scenario, where the only way to buy my products now is to join a subscription membership, and I think this is actually better for customers too. So don’t think you have to do the typical ascension model, which is a small-priced product and then a big-priced product, and then a recurring product, and then a big heavy thud factor product. And I’ll explain what I mean by that. Instead of having to say, pay, $39 to get a PDF and some MP3s, now people join a monthly subscription, but they can actually access all the information at once. And that is a little bit like a supermarket, in that there’s more things that people need than what they can consume. However, they can go straight to the aisle they need and buy exactly what they want today. They can have the thing they need right now. No drip feeding, it’s instant. You’ll see that inside SuperFastBusiness membership, where I put all of my event recordings, and all of my information products. People can ask questions right near the product, and they can be supported, not just by me but by other members who are experts as well. They can network with other people. They can go to local meetups. And they can build that lifetime community relationship and come to annual events. So it’s a really good way to put your information products. Now I sort of realized a few years ago as I was mapping out my business on a whiteboard, which I do about every 12 weeks, that I was drawing my products up, and one of them was this membership forum. And I drew a big circle of all my products inside a circle, and then outside the circle I put my joint ventures. And the membership that I had a few years ago was actually a joint venture. So half of it was in the circle, and half of it was outside of the circle. Then I realized that all of my products inside the circle were feeding this membership. I was literally leaking my revenue to a 50 percent share partner, who has amazing character, very honest, impeccable person, knowledgeable, but wasn’t really contributing to the marketing or the delivery or fulfillment of the membership to the same extent that I was, or that I’d expected when I went into the relationship. So I recognized this mistake and then I repackaged it. I pushed my product into the circle, and I put all of my little products into this one membership. And I was able to package it better for customers. They could now buy just one thing, and get everything. It’s much easier to understand the offer, it’s much easier for me to fulfill and deliver, and it creates a lot of leverage and power to networking between the customers. The important thing of course is to remember to remove your old products, and to redirect your URLs to the new offer page. As John Warrillow said when I interviewed him, you can’t be half-pregnant. You really can’t sell single products and an all-in-one membership. You should just commit. A snack or a meal? In terms of a snack versus a full meal, when I looked at my sales, the bottom 20 percent of my products were driving only one percent of my sales. That’s when I realized that I was giving people an easy option that doesn’t actually serve them well. They could pay a small amount, and they thought they were getting a bargain, but they were actually denying themselves a better education, because they weren’t consuming the product, they weren’t investing in themselves, and I was letting them buy a very small snack, like a packet of chips, instead of a nice meal. And they weren’t utilizing. A lot of people will not make it through a multi-product video sequence, or a multi-audio sequence. When I looked at analytics, I realized that a lot of people watch the first module, then a lot of people will drop off for the second, and so on and so forth. And by the end of multiple modules, hardly anyone is watching it;. And I also noticed that for an hour-long video, a small percentage of people will watch to the end. That’s when I realized I need to support people better. Better off to have one product they can come to and get the support. By studying my analytics and looking at my sales results, I was able to see this trend. Because you can’t really eat an elephant in one sitting. And only a fool measures an information product by the pound. Marketers have actually made people think that you need to sell these big, expensive, thud factor products, and that’s how people should measure it, by how big the box is, or how heavy it is. But recently, I was throwing some of these out from my garage, realizing that I never actually consumed the whole product. I’ve even got a hard drive on my shelves full of gigabytes of information that I got from one marketer, but I’m actually still scared to plug it into my computer, because I can’t commit the time to digest that information without any direction, without any support or ability to ask questions. It really is like eating an elephant. So when you give people a subscription membership, you think of it more like Netflix, where people can go and consume as they need it, right now, and get the support they need. In terms of my own customers, I’ve had lots of millionaire students succeed by taking my advice. I remember helping James Dyson come up with the OptimizePress concept, which was a game-changer for the industry. It went on to lead the path for other successful products, like LeadPages and Click Funnels. Then there was Kevin Rogers, took his copywriting information and put them into a membership subscription. Also, Chris Dufey did it., with his fitness niche. And Andre Chaperon recently did it with his information product as well. Now when it comes to joint ventures I just want to have a word on this, because it’s a tempting thing to do to partner up with someone because they’re going to help you, or they make you feel less alone. You don’t really need to do that anymore. There’s certainly genuine joint ventures where you might get a good co-host, or it could be a good marketing tool, and I do that with podcasts, although my constant bugbear is it’s very hard to get a co-host on a call at the same time. I do not do financial backend joint ventures these days, because I don’t really need to know that I’m established. So if you need to do it, because someone has a skill that you can’t hire, by all means. But always go in with the exit in mind. Joint ventures can be very powerful, but one of the main reasons not to do it is if you’re only doing it because you want someone to hold your hand. That’s a very common reason to do a joint venture, but it’s not a good reason to do it. Just join my SuperFastBusiness membership, and I’ll hold your hand instead and you’ll just pay a small fee, and you’ll never have to surrender a partner tax of half your business. So if you can get out of doing a joint venture, just join the membership, and let’s do this together. I’m James Schramko, I hope you’ve enjoyed this episode. I really want to stimulate your thoughts about how you package your information, and I super encourage you to think about the recurring subscription method of selling your products because it’s better for your customer, and it’s better for you. More information available inside SuperFastBusiness membership. Take care, and if you did enjoy this episode please share it with someone and give it a great rating on iTunes. I appreciate your listening very much. nice show – side note – you do your podcasts with your little buddies…! Podcasts I consider a Marketing Venture rather than a business. They are not profit share or $ value items. They are just a marketing channel. I would do it differently if I were to start again. I’d build them as regular guests on SFB rather than unique domains. It was still a really valid comment. Thought I might explain it anyhow! I love love LOVE this episode. This is an excellent summary of how to move forward with your business. James, I’m one of the ones who have been following and purchasing from you since xsitepro cheat sheet, and here it is many years later and you are still as valuable now as you were back then. You are the only internet marketer that I have followed for so long. The last couple of years I strayed away somewhat to start some offline ventures, and to also see what else was out there online (as far as memberships and services). I could write a book on all the disappointments. You, however, have never been a disappointment. From your products to your services to your valuable information..I have always been very much satisfied and forever grateful. Thank you so much for being who you are – an open an honest person that provides value to others. Now it’s time for me to join your membership again. Wow thank you Vernita! That was such a lovely comment. I really appreciate your kind words. Ah, the partner tax… that was one of the most expensive and heartbreaking lessons I learned the hard way. I was confused about how to have a paid product AND a paid membership. But its better to have only the membership.